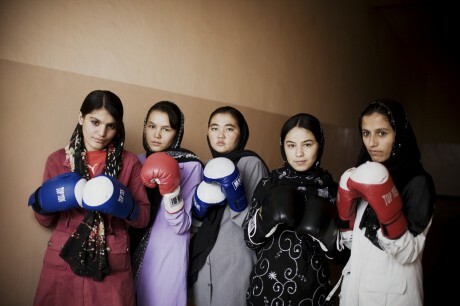 As children these young women were banned from playing sports under the Taliban. They now train at the Olympic stadium in Kabul, where the old regime would stage public executions. They have faced threats and battled social disapproval and religious condemnation in order to compete in the sport they love. Sadaf Rahimi, 18, was due to compete in the London Olympics on a wild card invitation, making her Afghanistan’s first female boxer in the Olympic’s first female boxing event. But on July 18 the International Boxing Association decided to withdraw the invitation, fearing she would not be safe in the ring against players of much greater ability. Afghanistan has five athletes in the Games: Mazood Azizi (athletics), Nesar Ahmad Bahawi (taekwondo), Ajmal Failsal (men’s boxing), Ajmal Faizzada (judo) and one woman – Tahmina Kohistani who will compete in the 100m. This is fantastic! Change – no matter how small it appears on the surface, is always good! I hope the number of the girls will multiply in coming days.